It's dupe comparison time! In a previous post, I wrote about a-England King Arthur, a gorgeous gunmetal grey. I thought it looked similar to Ciate's Velvet Tuxedo, so I decided to do a comparison to see if these were dupes or not. In the bottle, both look quite similar. Both are deep gunmemtal greys with shimmer in them. My Ciate bottle used to have a cute ribbon on it (I actually have a super old NOTD and a bottle pic of Ciate Velvet Tuxedo on the blog - it's super old, so look at your own risk). But over time the ribbon came off, so now I have a ribbon-less Ciate bottle. No cute ribbon...it actually makes me a little sad. Here's a swatch picture of the two in natural light. You can't really see it in the photo, but Ciate Velvet Tuxedo is actually a shade darker than a-England King Arthur. It's not a big difference, so for some reason the camera didn't pick up on it. The shimmer is the same in both colours, though. Below is another swatch picture, this time in more shaded lighting conditions. You can see the shade difference a little bit more clearly here. 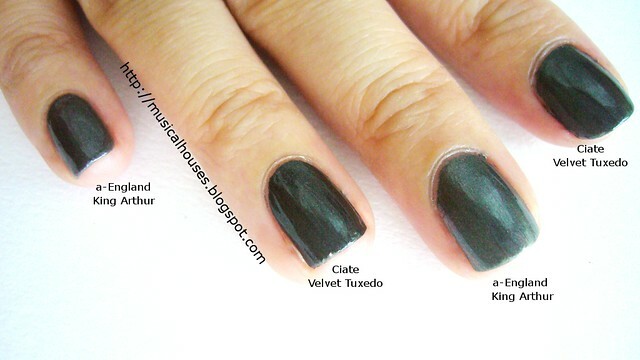 The Ciate shade is a shade darker than the a-England shade, but otherwise, both are quite similar. So, the final verdict - do you need both? To be honest, I feel like they are both quite similar. 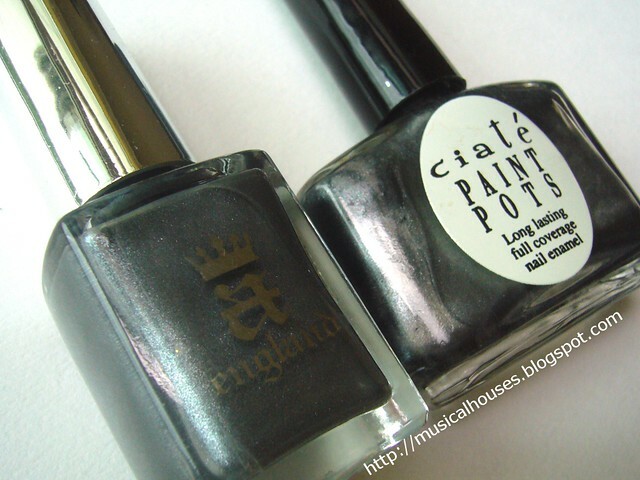 I'd get a-England King Arthur over Ciate Velvet Tuxedo, just because it's lighter and thus looks a little more grey and less black, especially in lowlights. But unless you wore the two side-by-side and looked closely at them, it's easy to think they're the same colour. Is there any difference in how they apply? @Eden-Avalon: Velvet Tuxedo is thicker in formula and more opaque. If you're careful, 1 coat will do. King Arthur is less opaque, so you'll need two coats, but the formula is slightly thinner. Otherwise I generally thought application on both was good. Schöner Blog :) mach weiter so!